The little girl has been reciting this poem recently after learning it in school and I thought it was a great opportunity for me to teach the kids on how they need to have the courage to dream, to work hard to achieve your visions, to persevere and never give up. Yup, if you know me, I'm quite a strong-willed, and somewhat stubborn, person and if I set my mind to do something, I go all out to do it. This trait has probably done me more good than harm and if you were to ask me what I would like to instill in my girls, at this moment, I would say tenacity and resilience. I want them to be able to bounce back when they fall, to grit their teeth and endure, to fight on strongly and push beyond limits. Too much for a 6-year-old and 3-year-old? Well, I say it's best to start from young. 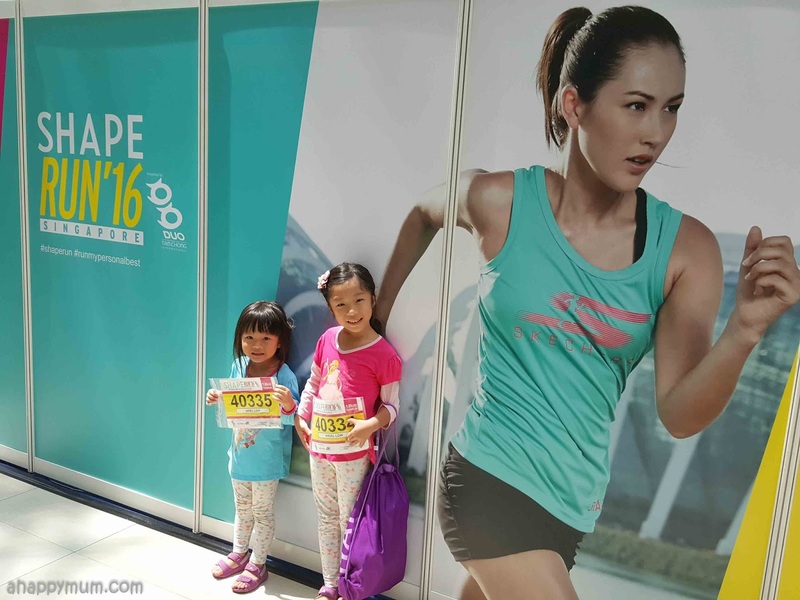 Last weekend, the girls and I participated in the Family Fun Run at Shape Run 2016. While it's just a 1.8km fun run and not a race, I wanted all of us to try our very best to accomplish whatever we could. 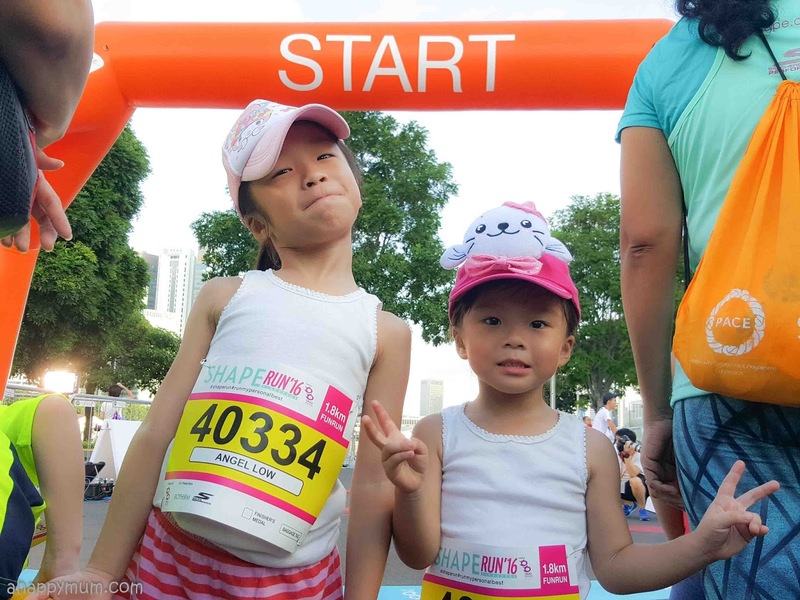 Although they have participated in a handful of kids' runs in recent years, most only lasted 800m and this was considered quite a long distance run for them. Believe it or not, I couldn't really sleep the night before! Yes, it's not my first or second or third or fourth or even fifth time taking part in runs, but I just don't know what got me so nervous and excited that night. 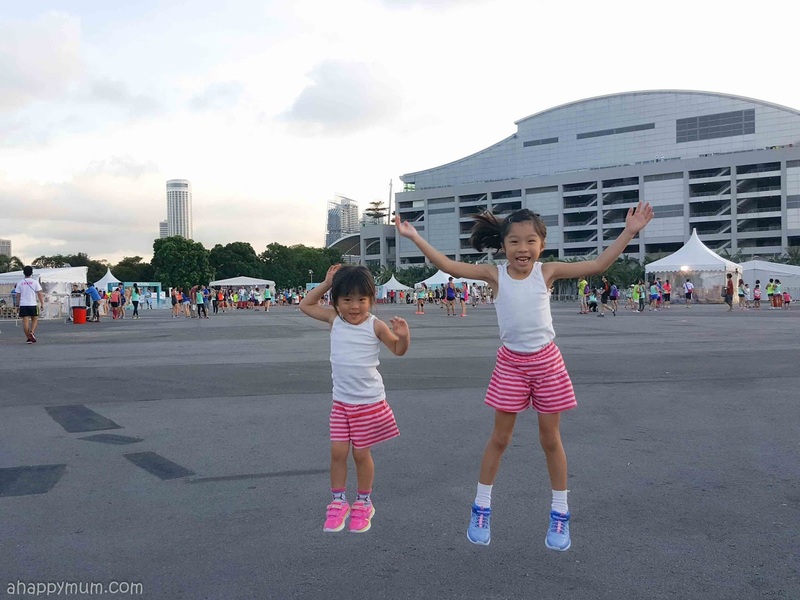 Perhaps it was because I recalled that we woke up late and only managed to arrive in the nick of time for Shape Run 2015 (that was when I ran 1.8km when I was still in my second trimester). Therefore, by hook or by crook, I was going to make sure that we arrived early this year. My strategy was to firstly, get ready and lay out everything we need, including breakfast, socks, shoes, attire, race bibs, caps, sunscreen, camera and so on. Secondly, make the kids go to bed as early as possible the night before, which was hard considering that we were at the NDP Preview which got them all exhilarated. Thirdly and most importantly, I told the hubby, who was going to drive us there and help look after the baby while I ran, that we needed to report by 7:15am even though the run would not start before 8am. Smart move, right? See? The benefits of arriving early on the scene means we got to take many wefies! Woohoo! I was so thankful to see that the weather was kind that morning and not only were there clear skies, it was also a cool and breezy morning which was simply perfect for a run! 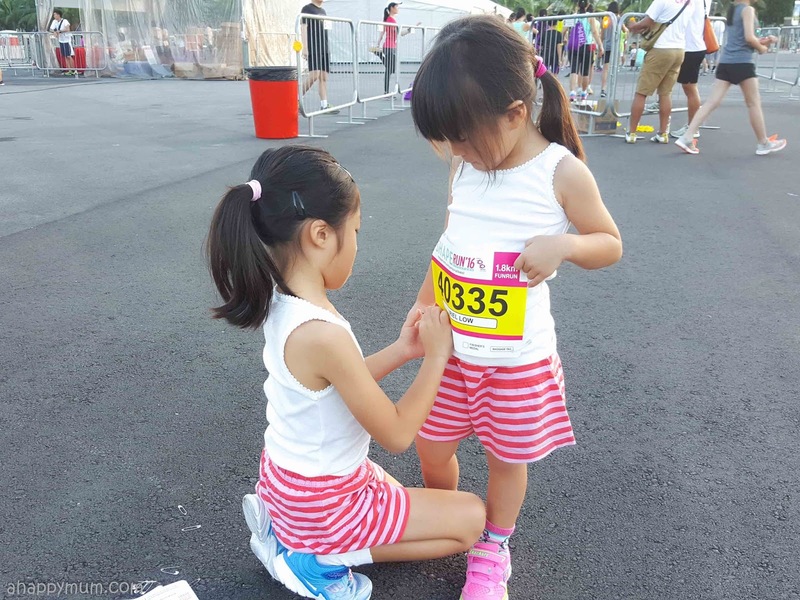 We took our time to pin on our race bibs, tie our hair and adjust our shoes. If you do ever join a race or a run, never forget to bring these bibs as this is how the organisers recognise and allow participants to join in. It'll be such a pity if you have to miss the run because of a forgotten race bib! Coming to our footwear, check out our new running shoes from Skechers! We have been fans of Skechers for quite some time and I must say they have never disappointed us. In fact, we are so excited to see that they keep coming up with these aesthetically pleasing, vibrant and eye-catching designs while maintaining protection, comfort and support. We'll share more about these shoes later! The race was about to begin! Before that, we definitely need to get ourselves stretched first. See? While many people were busy doing their own thing, we were some of the only ones who diligently followed and did the warm up exercise from start to end. Haha. Well, it was all part of the fun, right? I could tell that the girls really enjoyed it and that was what mattered. Another advantage of reaching early was that we got to stand at the starting line! 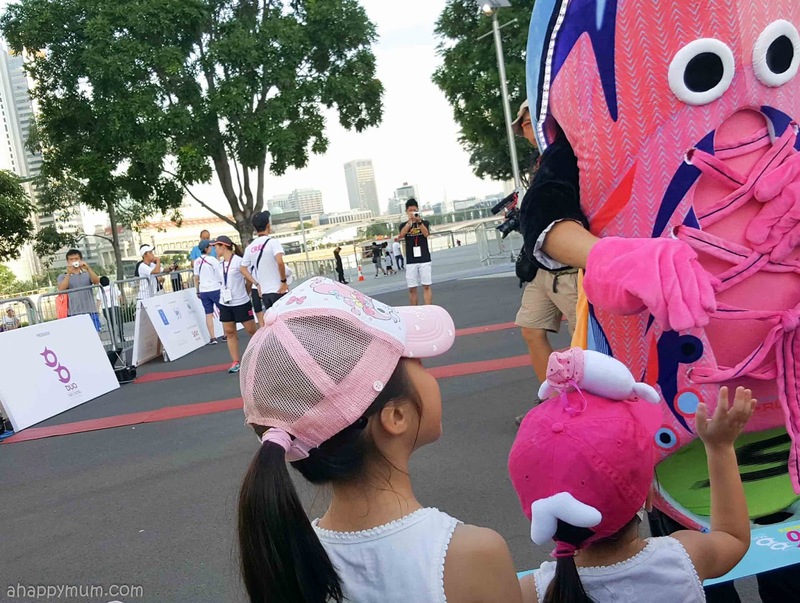 This was the very first time we did that and the girls were thrilled when they saw the gigantic Skechers shoe mascot and even managed to give it high fives. One last shot before the horn sounded! Ready, get set, GO! Can you spot us? Yes, there we were! 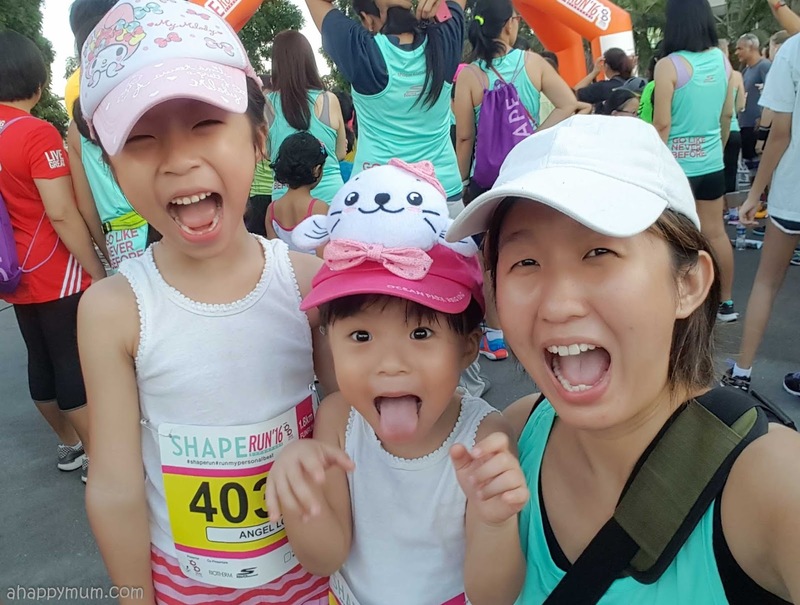 It was really an awesome feeling to be able to run with so many families and it is encouraging to see many other parents who love to run with their kids too and work towards an active lifestyle. The run was held at Bayfront event space and check out this view we had, doesn't it look great? Well, the pictures don't do justice and I only took two pictures because I told myself that I wanted to focus on running with the kids instead of being distracted by cameras and phones. So, that was what I did. Focus. Now, coming to the highlights of the run, I have to tell you two incidents that happened. The first one was when Angel fell down and scraped her knee. Yes, ouch. I have to tell you that she's quite a good runner and has more stamina than I would expect for a kid her age. So, during the run, she obviously had the ability to run faster than the little sister and many a time, she was turning around to look at us and make sure we were in sight. One time when it happened, her foot tripped on the boardwalk and she fell over. Did she cry? No. Did she whine? No, not at all. What did she do? She got up, I gave her a hug and she just continued running. Yes, that's my girl. No tears, no giving up. She only realised that her wound was bleeding after the race and that was when we stopped to get it cleaned. I was so, so proud of her for being strong enough to go on and determined enough to get to the finishing line. The second one involved who else but the little sister. 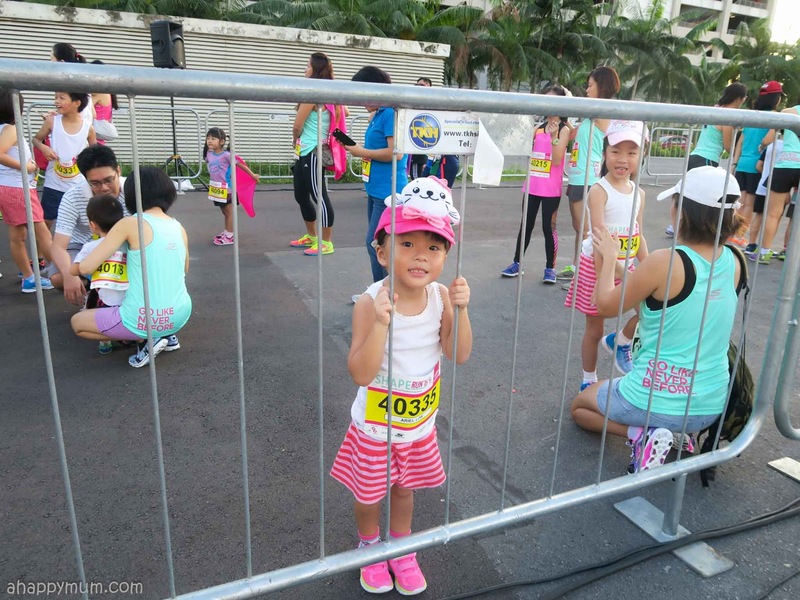 Now, this three-year-old girl started to whine and complain that she was tired when we were just a quarter way through the run. She panted, she grumbled, she moaned, and she kept saying "My legs are so tired". Would you, as a mum, let her stop to take a short break? I wasn't sure if I should, but I didn't. And I'm very glad I didn't. What did I do? I sang nursery rhymes to engage her, I did cheers to encourage her, I chattered a lot about not giving up and turned it into a chant. Yes, I can't believe I did all that because I was panting so hard. 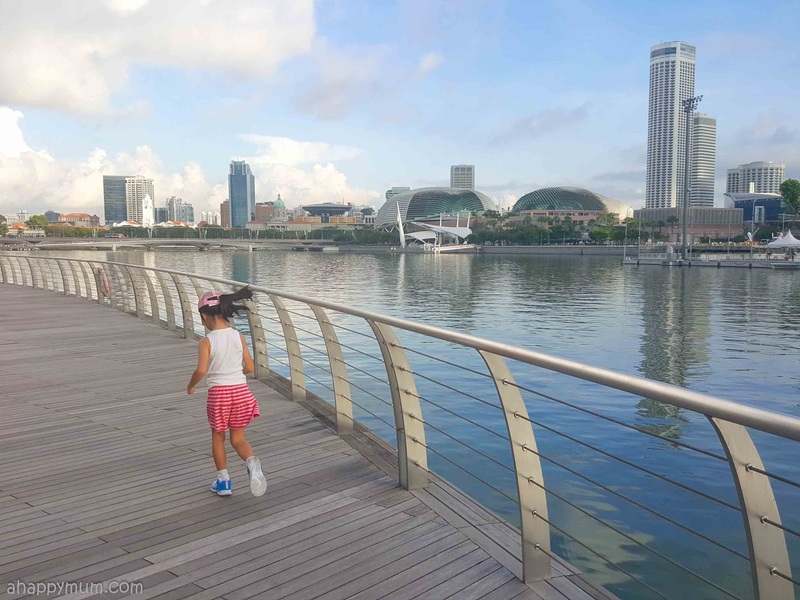 There was a point when she started whining with every step she took, to the extent that it annoyed me a little and I told her "If you channel all your energy into running instead of whining, we'll be at the finishing line already." Then, I asked her to 'catch' her sister who was up ahead. I also kept telling her that we were nearing the end and the words that I kept repeating incessantly were "You can do it, meimei, Don't give up." She requested for me to hold her hand for almost the entire journey. She almost broke down several times and couldn't stop ranting. She even cried the moment she saw her father at the ending point. But guess what, SHE DID IT. She didn't stop for the whole 1.8km and I'm just so, so proud of her too! Sure, we became slower towards the end and other people overtook us. We didn't come in first and we probably didn't clock a fantastic timing. What mattered to me was that we did our very, very best and we reached beyond what we thought we could achieve. It wasn't just me they amazed, but they surprised themselves too and I know that they felt that incredible sense of achievement. How very priceless that is, right? So, they truly deserved their medals after the run and we are going to have so many fond memories whenever we look at these medals in future. For the rest of the day, these girls were terribly excited to share their experiences with friends and family, and their starting lines went along "I fell down but I got up and ran!" and "I kept whining and whining BUT I didn't stop!" Every time I heard it, I couldn't help but smile. 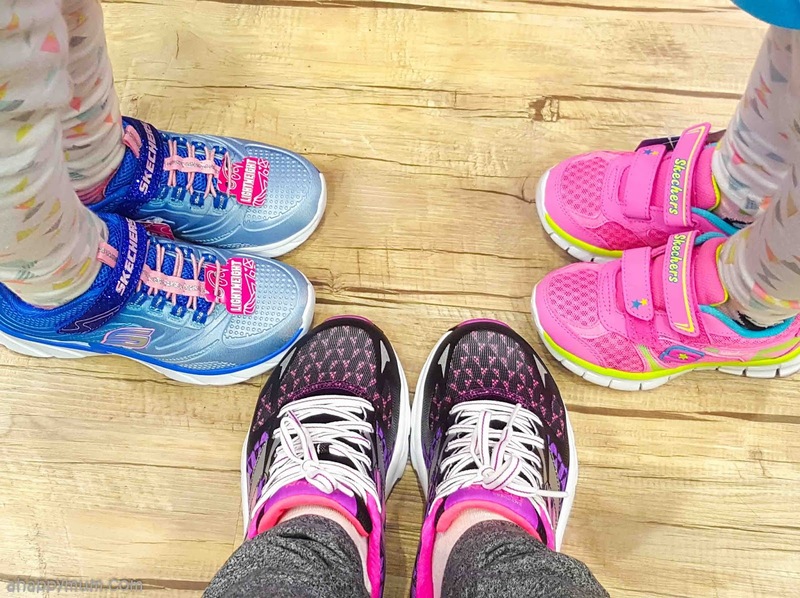 So, here's a big THANK YOU to Skechers and Shape Run for teaching my kids such an important lesson and I really hope this is the start of them learning what it truly means to never give up. We definitely hope to take part in more family runs in future and I can't wait for my baby boy to be big enough to join us on our adventures! Having a good pair of shoes can be the key to maximising your potential and ensuring your comfort during a run. 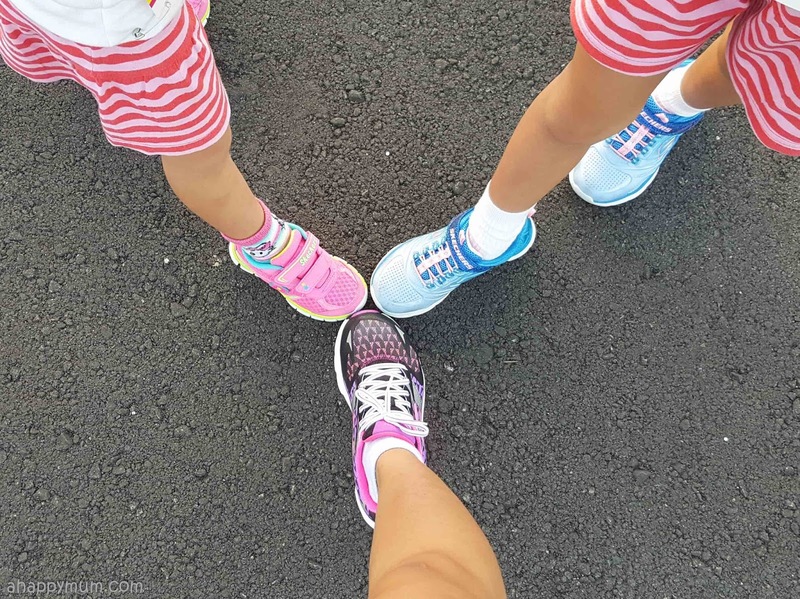 I find that this is not just important for me, but even more so for the kids too and while I'm not so particular about what sporty attire they wear, I like to feel assured that they are clad in a pair of good, quality footwear. Skechers has over 18 concept stores located across the island and you can easily find a store that is most convenient for you here. 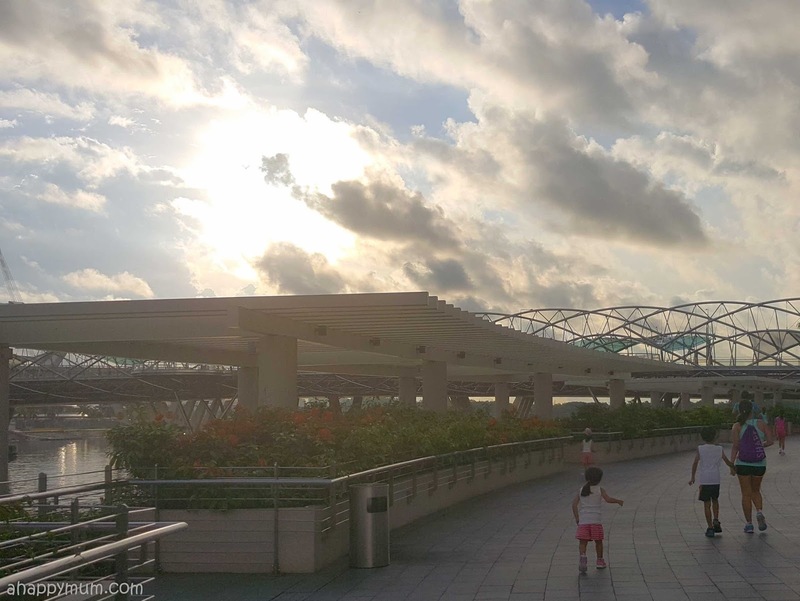 The newest outlet is at Junction 8 (#01-10/11) which just opened on 20 July. We visited the store in ION Orchard (#B4-28) and were once again impressed by the prompt service and friendly staff. While I was helping Angel to determine if her shoe fit, one of the staff helped Ariel to try on her shoe and found the right size swiftly. I have always been amazed by the variety of appealing designs they have in the kids section and the girls usually have a hard time picking out their favourite because they love so many of them! This time round, I got for myself the GOrun Ride 5 which features increased cushioning and midsole for additional impact protection and response. Angel is wearing the Swirly Girl - Shine Vibe which has a mesh fabric with embossed details, an ombre colour effect and a glittery top strap which she loves madly. 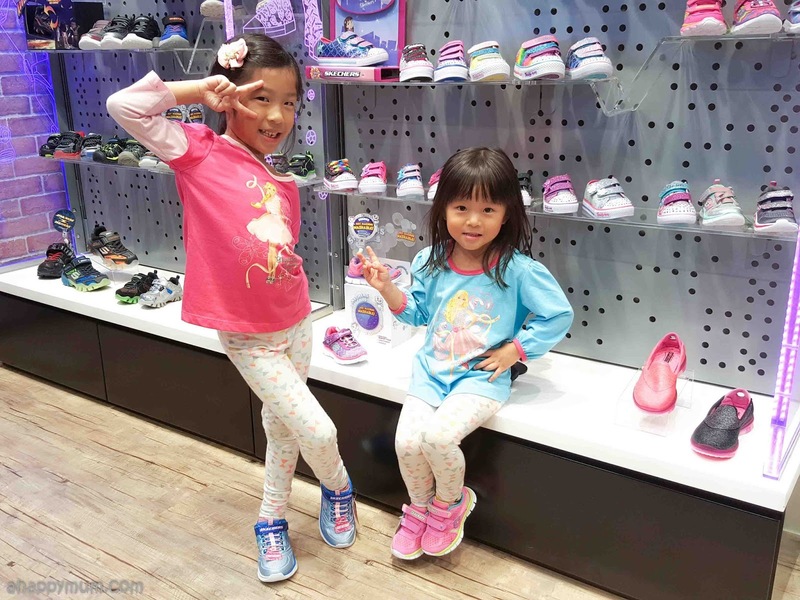 Ariel's is the Girls Skechers Foamies Trainers which are lightweight, washable, come with memory foam soles and velcro fastening. I have to say that we do really love these shoes because they are so comfortable to wear! In fact, I make them wear these shoes whenever we go to parks, nature reserves and vacations. Yes, all of us wore our trustworthy Skechers shoes every single day when we were in Taiwan for eight days and they never caused us any problem. There were even days when we would trek for hours in a row and the kids never raised any complaint or discomfort with their shoes. It's not hard to tell that these two were mighty pleased with their new shoes, right? 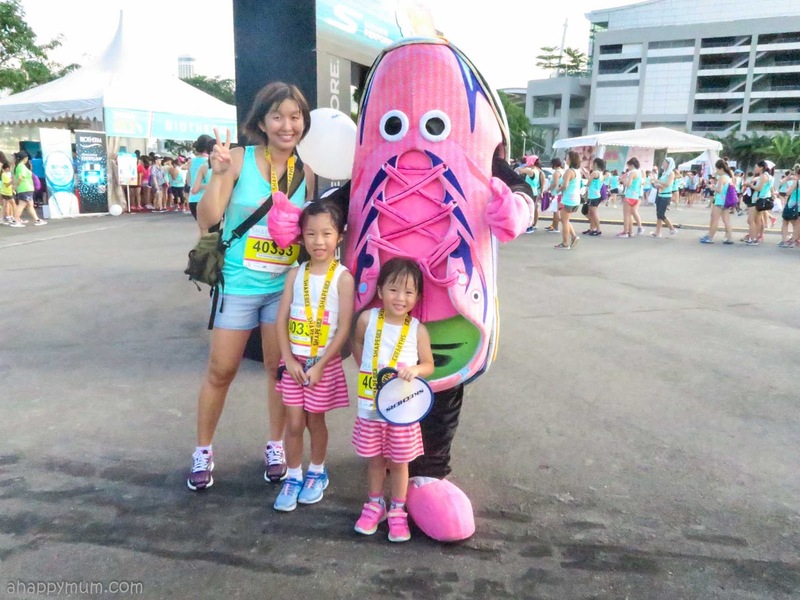 I believe that having been equipped with a good pair of running shoes partly helped to make them look forward to the run even more and gave them a sense of confidence that they needed. 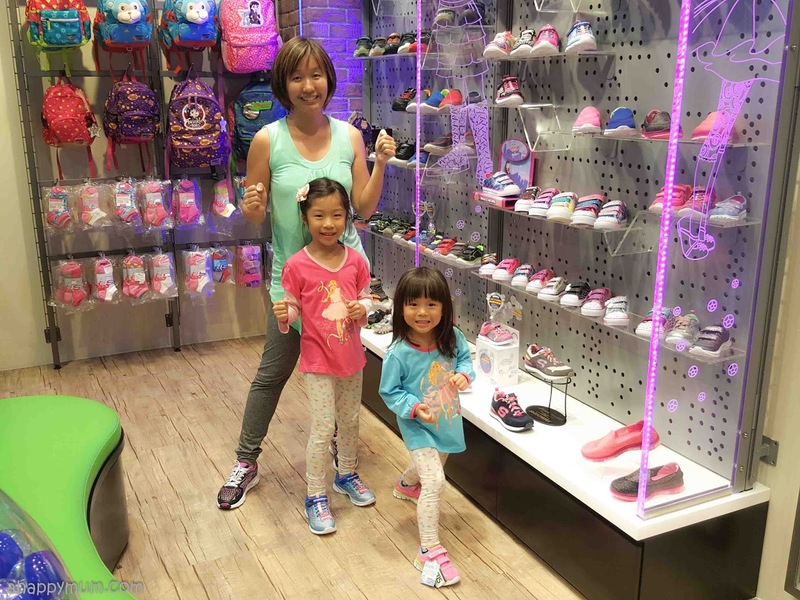 If your kids like shoes that can light up, then check out the Twinkle Toes (for girls) or Hot Lights (for boys) series, these are bound to be a hit with the little ones! To top off the experience at the store, the kids were rewarded with one 'token' each so they could have a go at the toy vending machine. Yes, a customised vending machine right inside the Skechers store! The girls got a finger light each from this trip, not bad right? 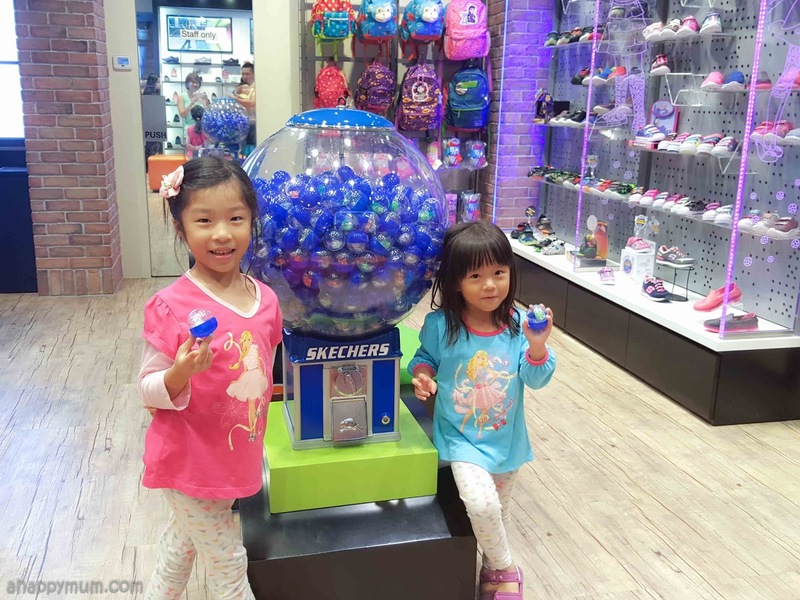 Well, it's no wonder they have such an awesome impression of Skechers and love to visit the store! So, that's it for now! 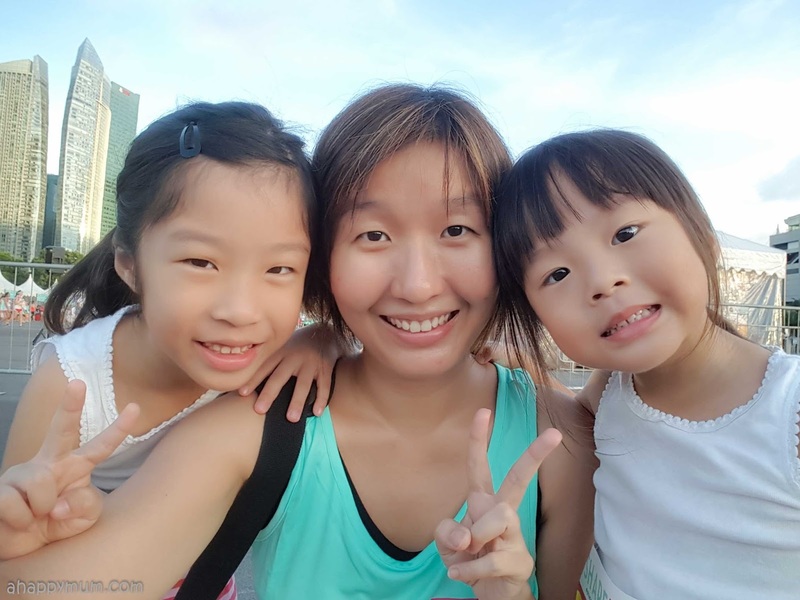 We'll definitely try our best to make full use of our running shoes, go outdoors more often, explore more new sights and build up a healthy lifestyle as a family. 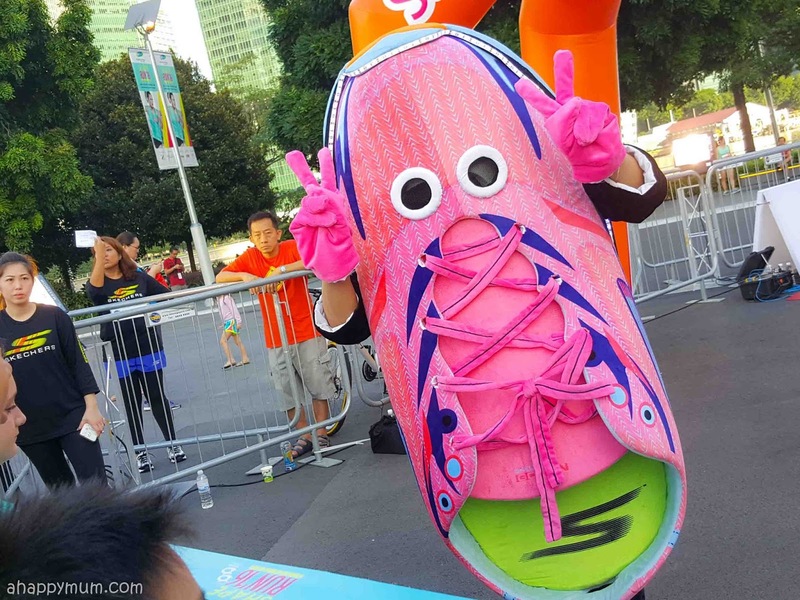 Disclosure: We received a media invite from Skechers to participate in Shape Run 2016 and they also kindly sponsored our shoes for the event. All opinions are our own. Ariel didn't stop at all for 1.8km! Awesome!!!!!!! Well done, girls! Wow you are so fantastic. Still can wave and pose when the race started. I imagine I would be "Ahhhhh my kids! Come hold Mama's hand!!!!" haha! Which in turn portion of this specific undertaking think is going to take essentially the most occasion? Ans: As outlined by your career facts, We've several years involving suffers from throughout the two job areas.